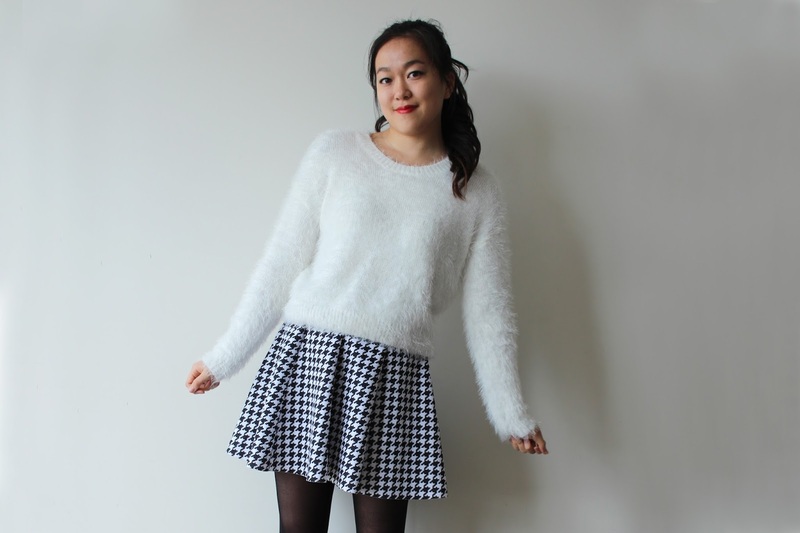 Here's one of my favourite sweater-and-skirt combos of the season; a fluffy white crop jumper paired with this houndstooth skirt. I've worn this outfit a few times already with various shoe options, although I think I like this version best; paired with my trusty booties and a bright red lip that really pops amongst the monochrome. Also, I am seriously loving the fun, high-contrast print on the skirt; it feels a little bit school girl (especially with that high pony) but with a much edgier twist. This is the first houndstooth item I've acquired, and I feel like more may be making it's way into my wardrobe soon..
Is it bad that I don't think I've ever owned any houndstooth clothing? I think you may have just changed my mind. I can't wait for the weather to get a bit colder, so I can start wearing tights, skirts, jumpers and boots. Missed your outfits girl!! This is so cute :) The fluffy jumper makes me excited for fall/winter clothes!